What’s better than giving someone an awesome gift that you know they will love? Giving one that you will love too. Usually, home upgrades can’t qualify as gifts. No one wants an exterior paint job for Christmas. But these smart home gift ideas make your home awesome, while also serving as excellent gifts. It might be hard to justify the high prices of smart home technology during the year, but they make reasonable gifts during the holidays. Not only do smart home gifts surprise loved ones with something futuristic and flashy, they also pay off all year, improving their quality of your life, decreasing utility bills, and boosting your home’s value. These smart home gift ideas are designed for literally anyone. Non-technical parents? Check. Gadget-obsessed husband? Check. Budget-oriented girlfriend? Check. Wanting to buy a gift for yourself? Check. With WeMo Insight, you can make any simple device, like a fan or lamp, smart. WeMo Insight also provides information about how much energy the device draws and what this means for your monthly bill. 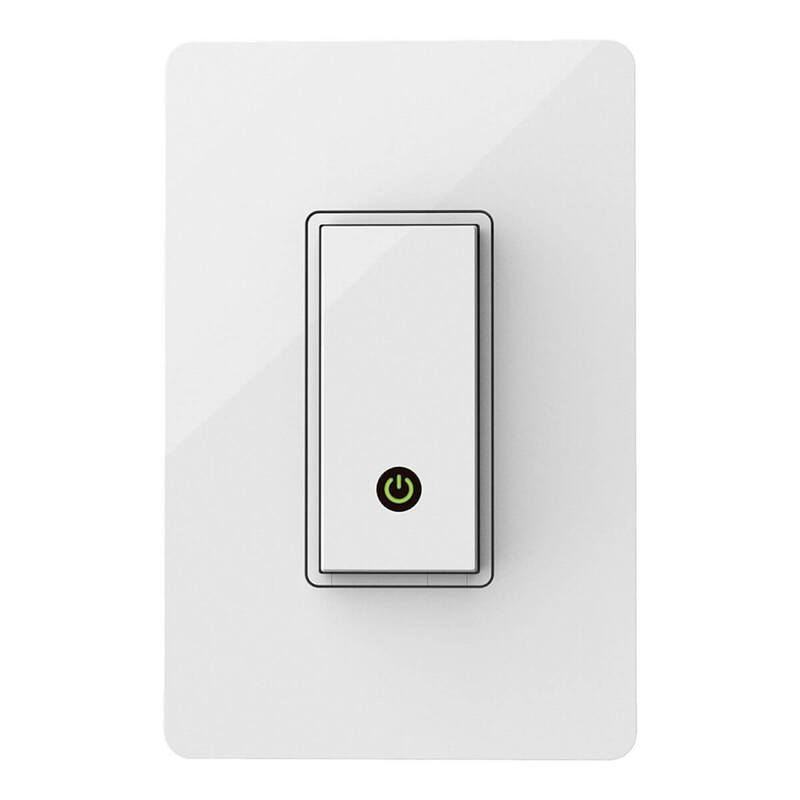 Read our full review of the WeMo Insight Switch, or for a cheaper alternative, check out the TP-Link smart plug. 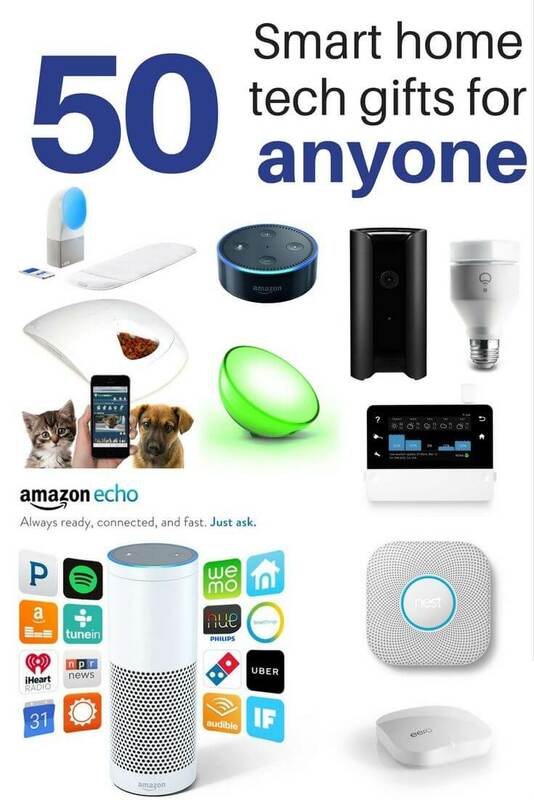 Remember Amazon Echo? This is the compact version that many tech bloggers are calling better than the original. At a fraction of the price, Echo Dot 2nd Generation does everything that the full Amazon Echo can do, and more. It connects with external speakers that provide higher quality sound than the original Echo. Read our full review and comparison for more details. 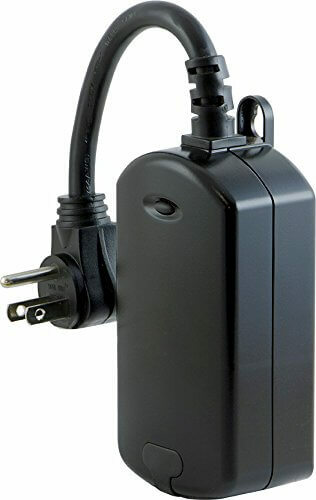 Similar to the WeMo Insight Switch, the GE Z-Wave lets you make anything that plugs into an outlet smart, but this is designed for outdoor use. This means you can control and schedule anything, including your holiday or outdoor lighting, with your smart phone. Since it’s Z-Wave compatible, it also connects to your smart home hubs like SmartThings. This tiny smart button can do almost whatever you want it to. Calling your phone, turning on smart lights, sharing your location, sending a Slack message, and many other skills are possible with this tiny, minimalist button. Program it for specific actions with one tap, two taps, or one long press. Find out specific actions in our hands-on Flic review. 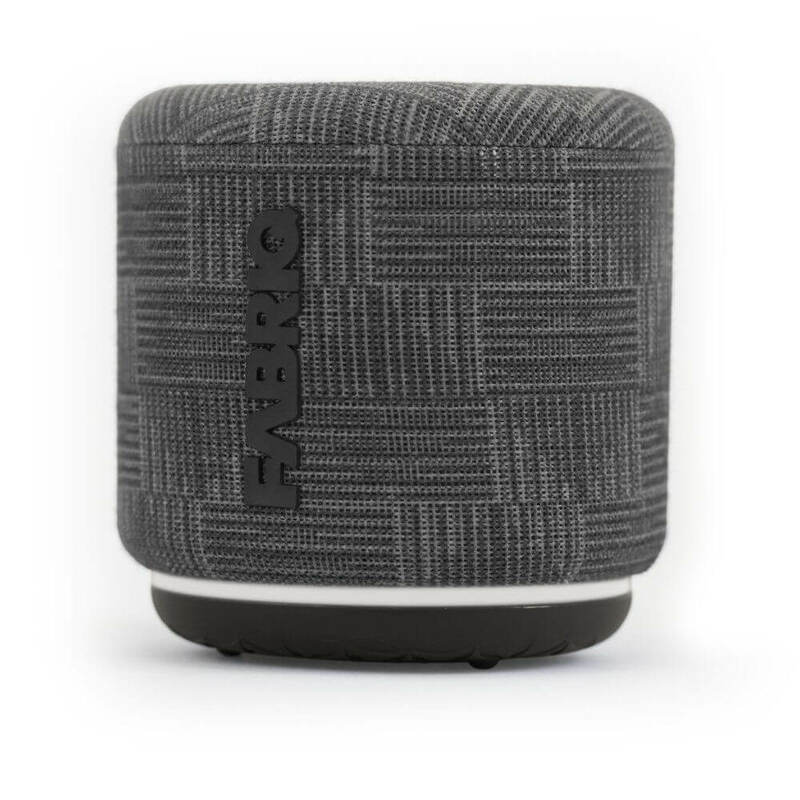 If whoever you’re buying for already has an Echo device, then this little speaker is one of the smart home gift ideas that will be a great addition to their setup. It has soft fabric sides, Alexa built in, and a battery life of up to 5 hours. While you will have to tap on the button to activate Alexa (instead of simply saying her name), this is a great option for backyard or on-the-go use. 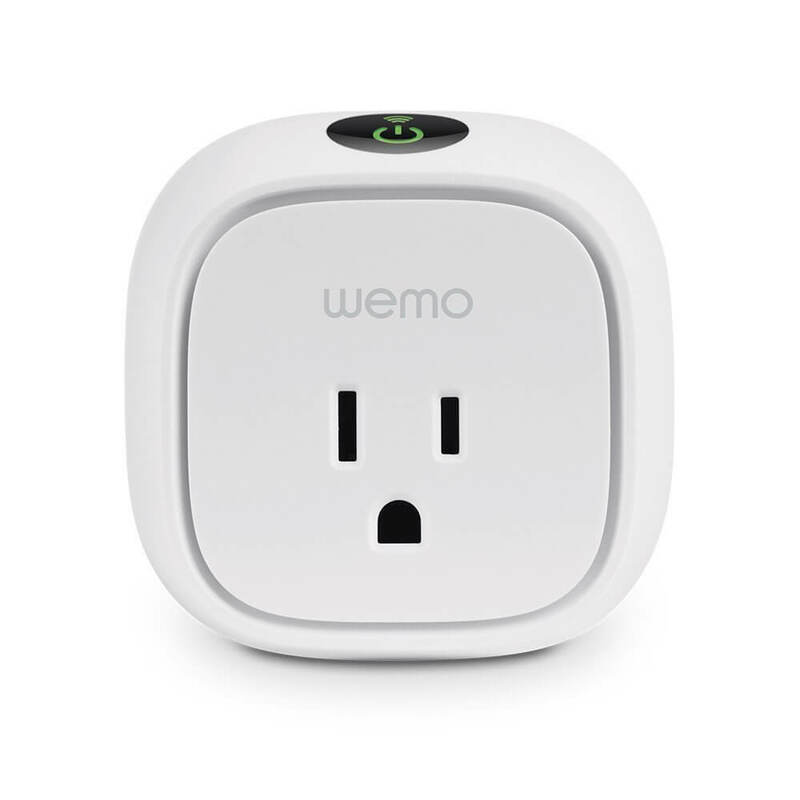 If you’re giving this gift to someone who likes smart tech with a traditional touch, then a smart light switch like the WeMo is an excellent option. 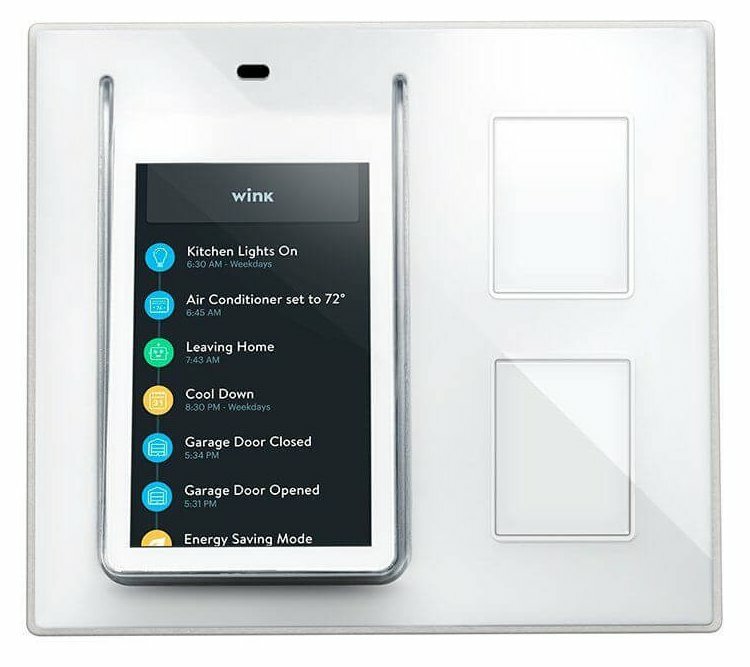 It lets you control your lights with the physical switch, and also connects to WiFi using the app in your phone. 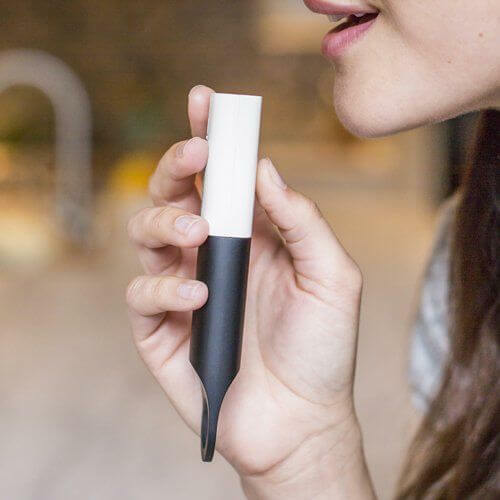 The Dash wand is a dirt-cheap little device that has Alexa built into it. You can ask Alexa questions, turn off the lights, or add to your shopping list, but what really makes this device unique is its scanner. Located on the end of the wand, this can add items to your cart on Amazon with an easy scan. 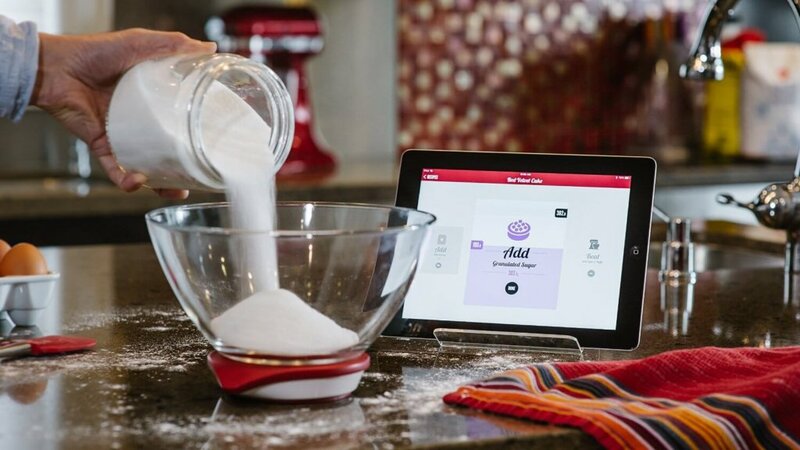 It’s great for quickly replenishing your pantry, or using as a smart home remote. A perfect smart home gift for the chef in your life, this smart scale connects with your tablet or phone to help you measure or weigh any ingredient. Follow easy recipes with step-by-step instructions. LIFX + is the newest smart bulb by LIFX. It lets off invisible infrared light at night to help illuminate dark areas of your home for security cameras. 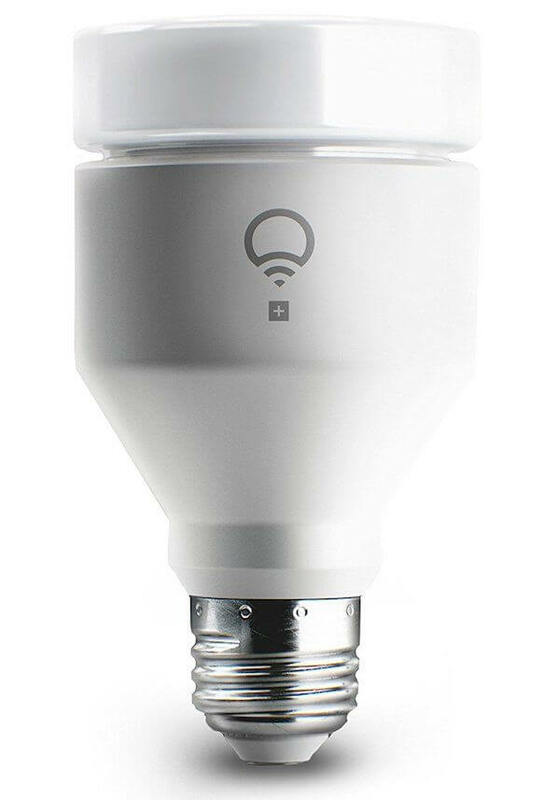 Just like the original LIFX, it has the brightest and most brilliant colors of any smart bulb, and works with Alexa, IFTTT, and other services. Read our full review here. 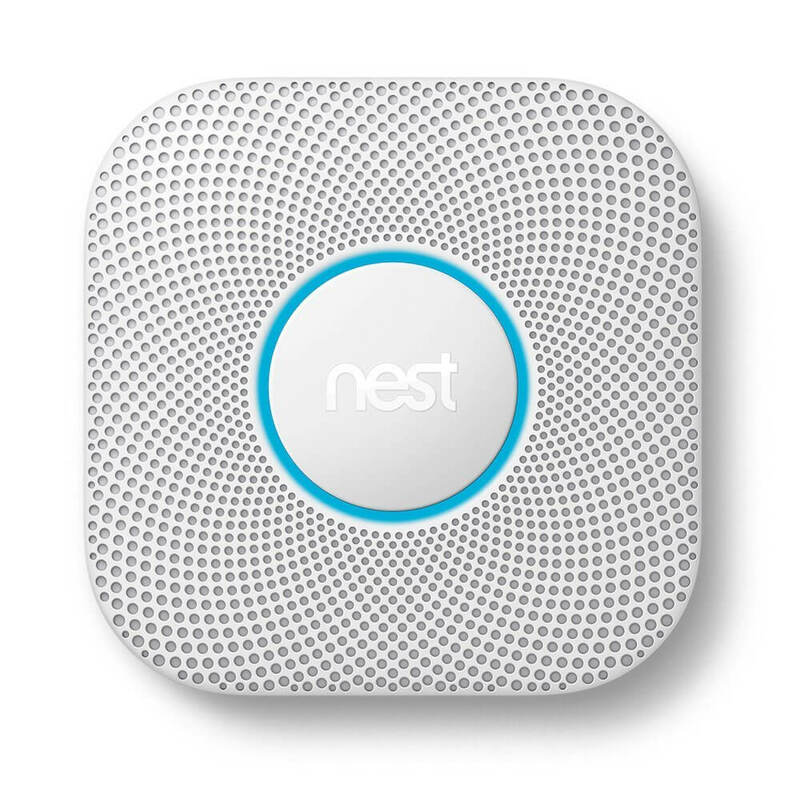 Nest Protect ends the 3 a.m. chirp signaling a low battery. Instead, it notifies you on your phone well before your battery dies. When your alarm goes off, you can get alerts and silence it from your phone. This makes our list of smart home gift ideas because it provides so much value and protection. 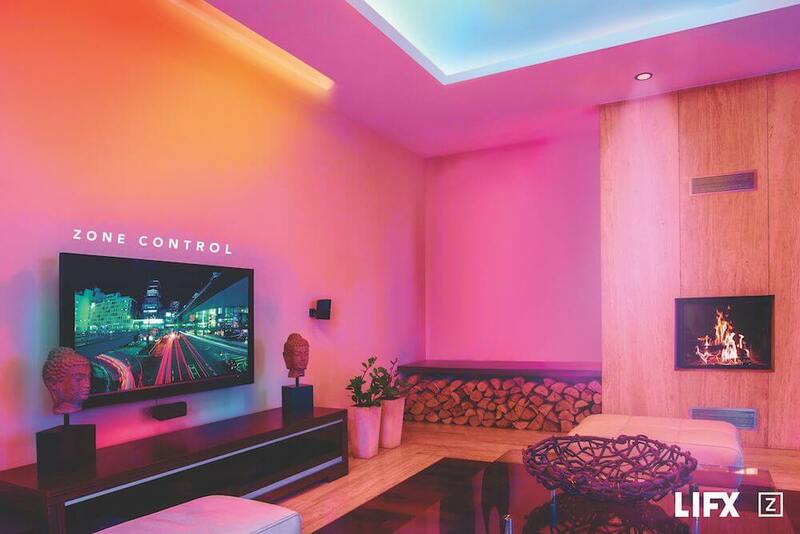 Control all of your smart home in one system using this touchscreen controller. This is a great upgrade for anyone who uses the Wink hub to control their smart home, because they can control all of the devices on-screen. It also has two light switches next to the controller for traditional on/off function. Philips Hue smart lights provide excellent ambient light. They are smart and multi-colored, and can incorporate with third-party apps for themed Halloween or Christmas lights. 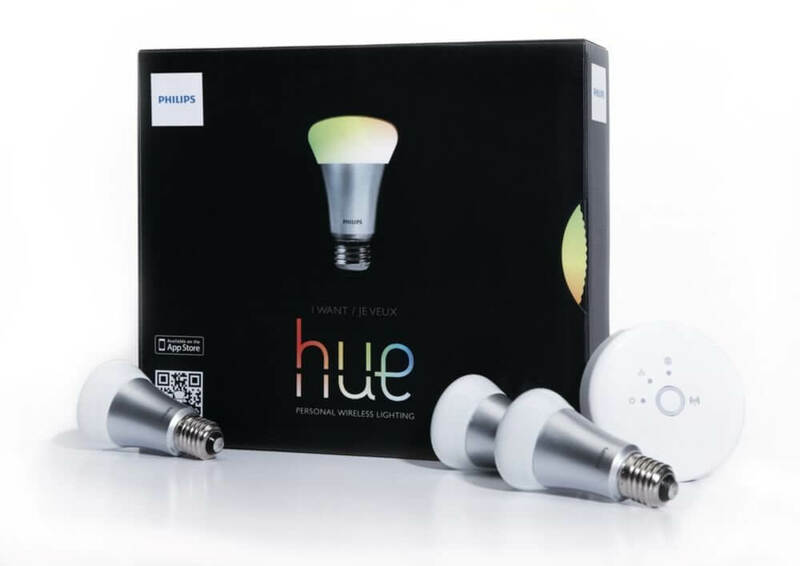 Note that you do need the Philips Hue Bridge (hub) to connect your bulbs, so you may want to consider a starter kit if your gift recipient doesn’t already own Philips Hue smart lights. Get alerts if your garage door doesn’t close after 30 minutes, then close it remotely with your smart phone. 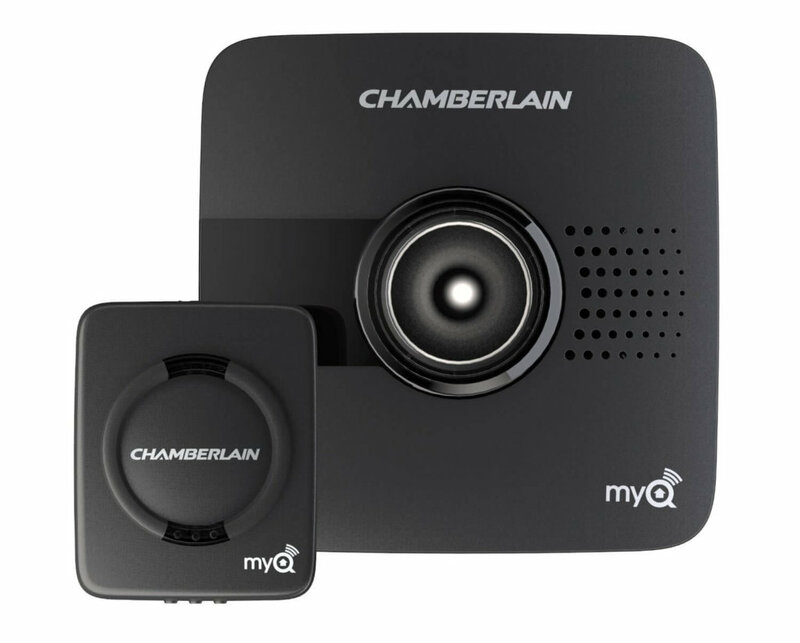 Read Garageio vs Chamberlain MyQ vs GoControl Linear to find out why this smart garage door opener is our favorite. 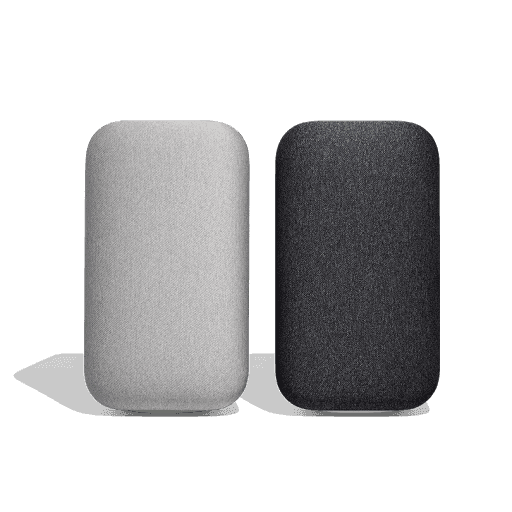 The new version of Echo is smaller, cheaper, and comes in several different color and material options. 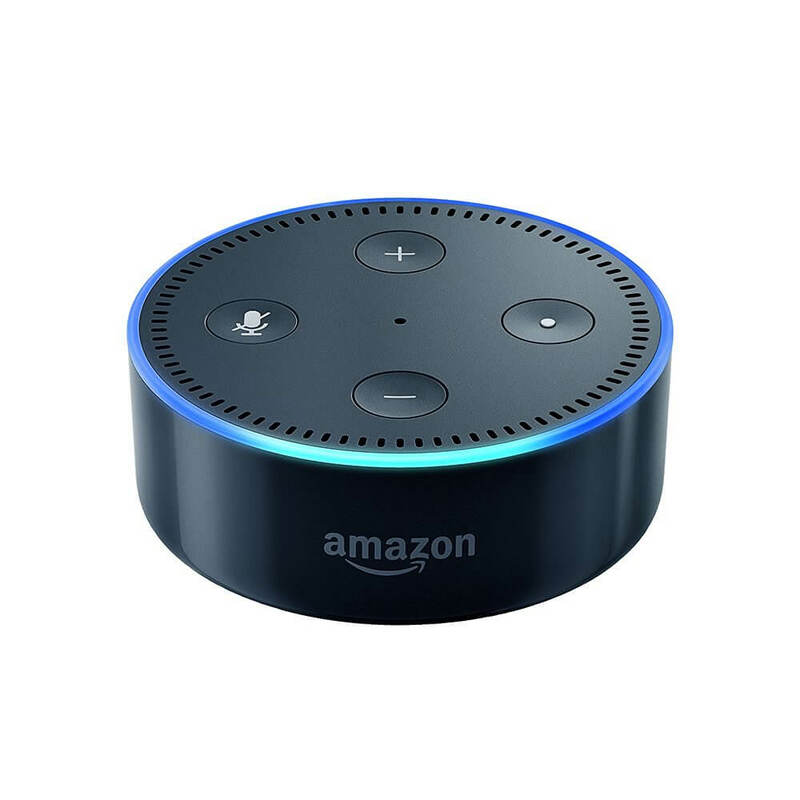 Since multiple Alexa devices can work together easily, it’s one of the best smart home gift ideas for someone who needs to upgrade to the newer gadget, because they can still use the old one, too. Compare with the older Echo here. LIFX Z is the new smart multicolor light strips that do not require a hub. These are divided into zones and each zone can be a different color, creating a brilliant light strip with a variety of colors. There are so many options for using these light strips, from kitchen cabinets, to hard-to-decorate ceiling eaves, to behind the TV. Anyone opening this gift will be excited to light up their home. You know that friend who always loses everything? Get them this smart home gift. 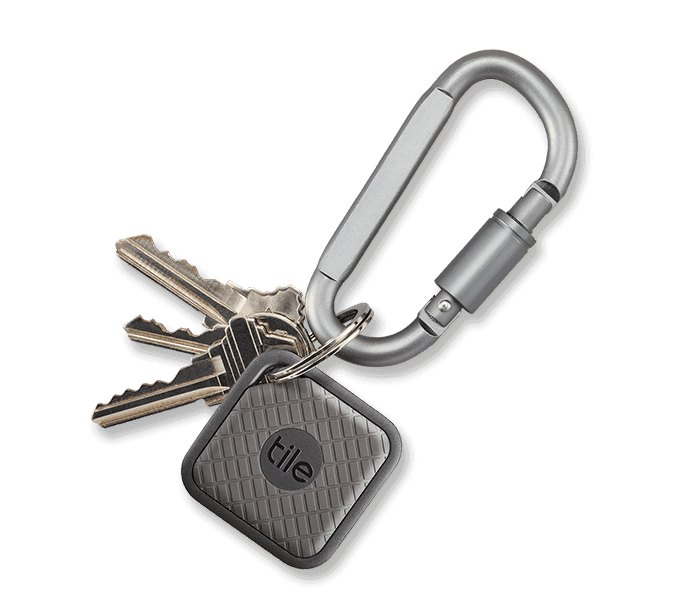 Tile has been around for years, but their new Sport line is designed to be more rugged and has improved Bluetooth radius. Measure the health of your plants in realtime, including soil moisture, fertilizer, temperature, and light intensity. The device gathers data with 4 sensors every 15 minutes, making it an ideal gift for the one with a green thumb on your gift list. 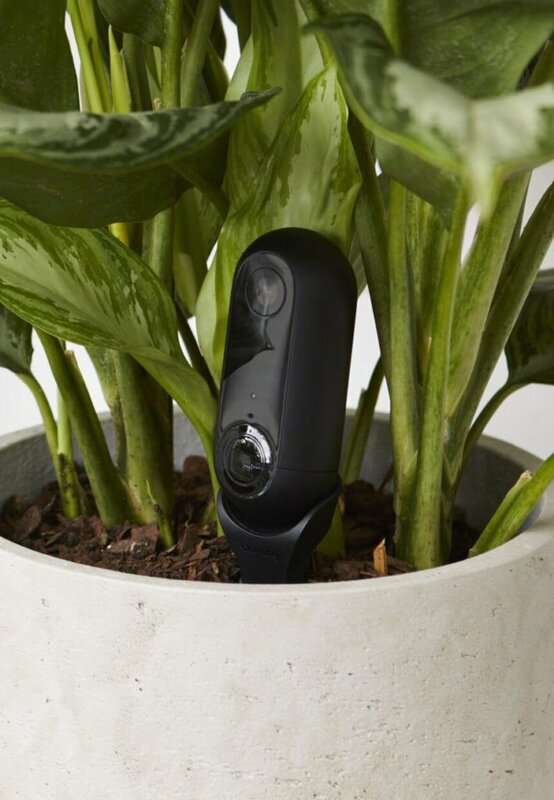 Canary’s newest camera is designed for outdoor use. It works on batteries or plugs into the wall, but best of all, it has optional cell tower as back up in case your Internet is down, giving your home security and protection at all times. The new, sleek, cheap Nest Thermostat E works with Google Home and has a beautiful frosted display. 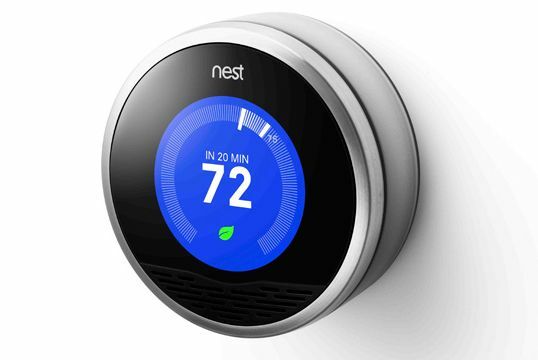 It has almost the same features as the original Nest, at a much more affordable price. This gift is perfect for busy professionals or moms who don’t have time to cook in the kitchen all day long. 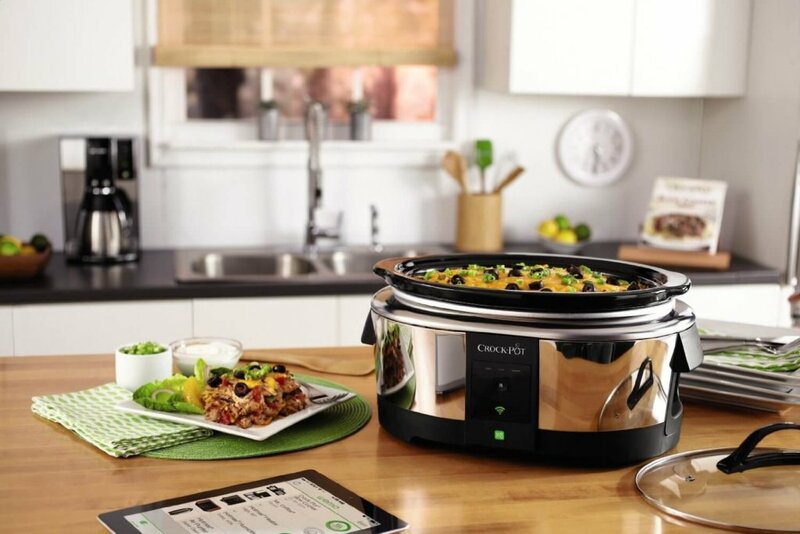 Control this Crock-Pot remotely with your smart phone to change its temperature, cook time, set a timer, or see how long your food has been cooking. 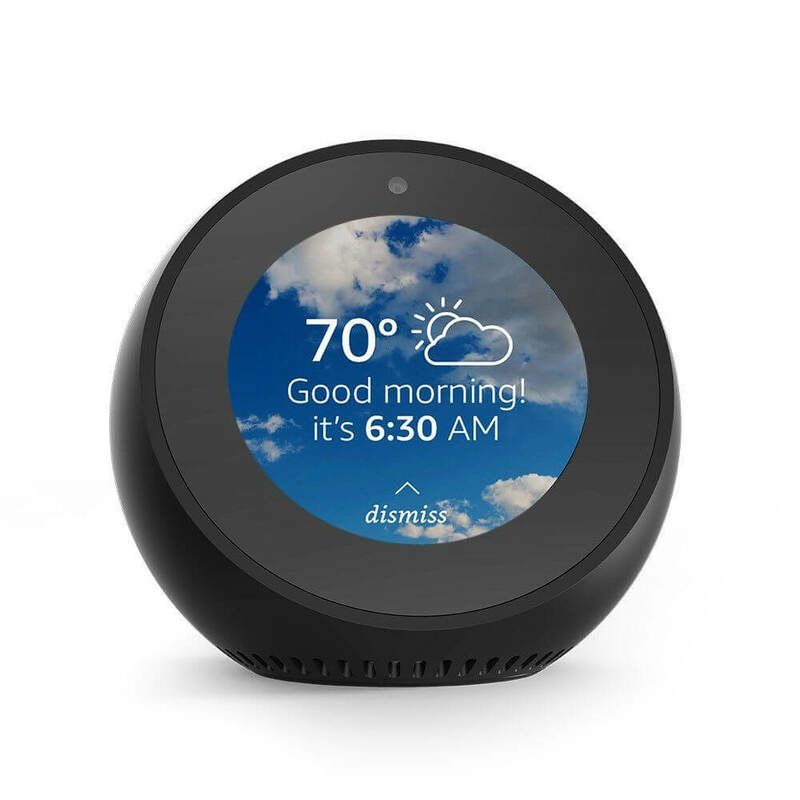 Basically functioning as a smart alarm clock and video caller, Echo Spot displays news, weather, lyrics, and video calls on its small screen. It can also control your smart home, just like the other Alexa devices. This is one of my favorite smart home gift ideas because it works so well on a nightstand. 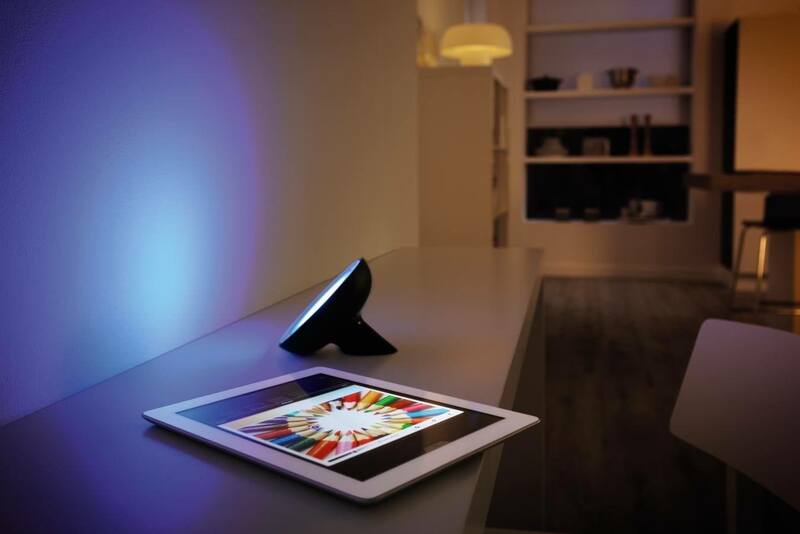 For the techie who is just getting started with their smart home, the Philips Hue Starter Kit is the way to go. The bulbs are very versatile and a few bulbs go a long way – put one in the living room, office, and bedroom. Hue has a huge variety of smart bulbs and lamps. It works with Amazon Echo, IFTTT, and is compatible with many other smart home devices. 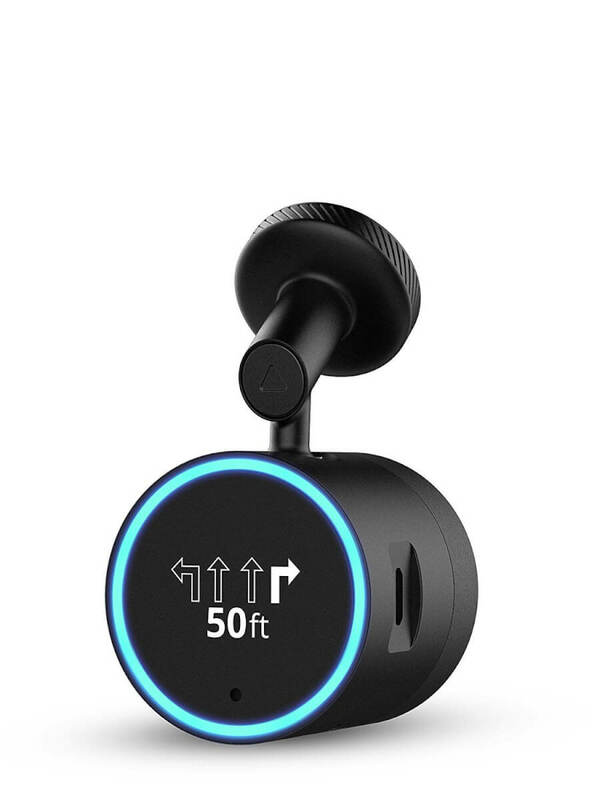 Garmin Speak gives you turn-by-turn directions with Alexa built in. It can also play music on your command, create to-do lists, and give traffic updates. It’s a great smart gift for your friend who gives terrible directions while you’re behind the wheel. 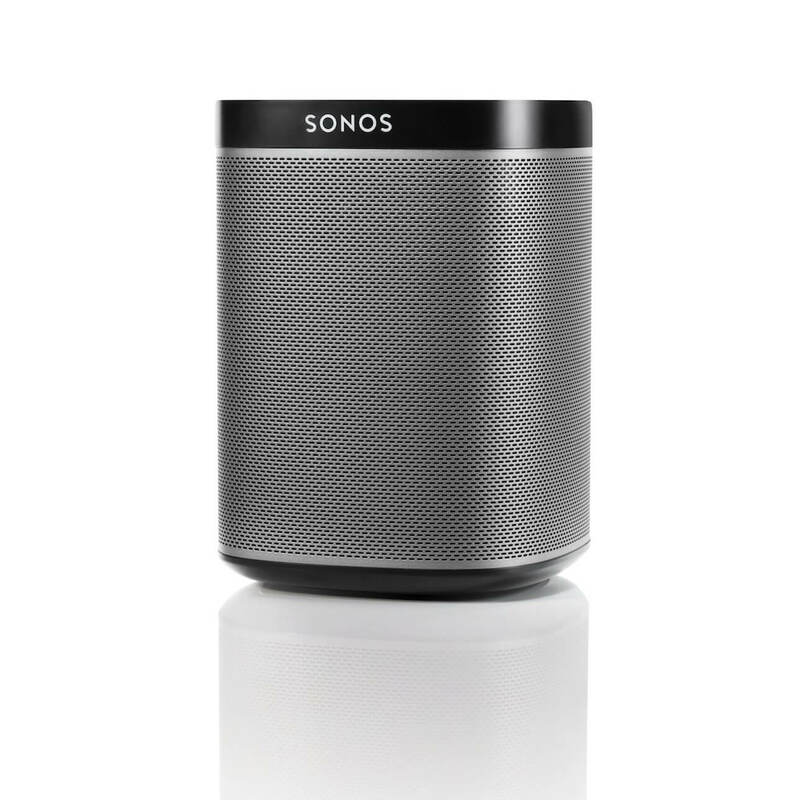 SONOS recently announced their upcoming partnership with Amazon Echo. That means that music lovers can easily connect their Amazon Echo to SONOS speakers, which have much better sound quality. 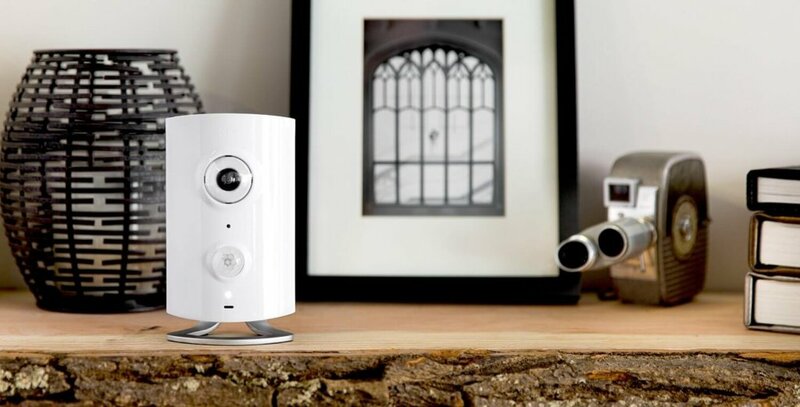 Canary is one of our favorite smart security cameras, partly because it’s so much more than just a camera. It includes a 90+ dB siren, HomeHealth technology for monitoring air quality, and auto arm/disarm based on your location. This is one of the best smart home gift ideas for students or professionals who take lots of notes, or even doodlers. 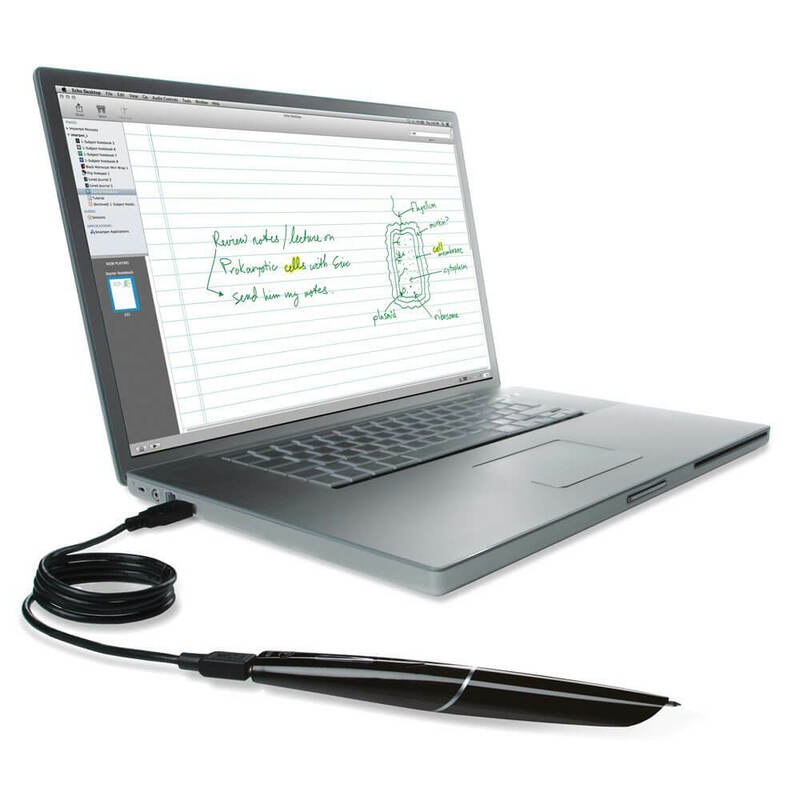 Livescribe’s Smartpen doubles as a voice recorder and instant digital note taker. This allows users to keep a traditional notebook while simultaneously making their notes digital. 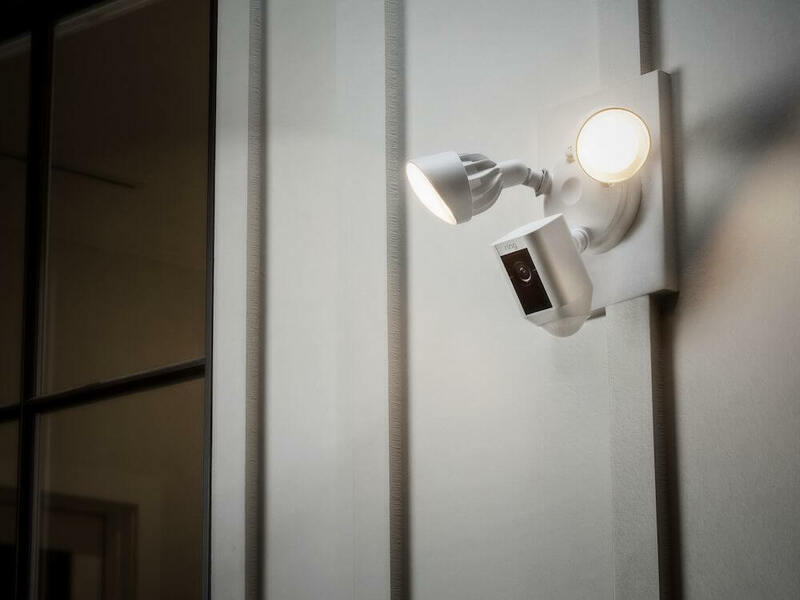 Kuna is a smart porch light and a security camera all in one. This sleek device is ideal for anyone wanting to protect their porch without making guests feel like they are entering a maximum security penitentiary. It also offers a two-way intercom for communicating with anyone who comes to your porch remotely. This smart clock has an awesome display that looks like the 1980s blended with smart home gadgets. The clock works with IFTTT, Hue, and Alexa, gives you notifications in real time, and has thousands of unique clock faces. This is technically still an IndieGoGo campaign, but its massive success convinces me that it will be around for awhile. Ever wish you could play with your dog from your work desk? That’s now an option with PlayDate. The ball has a camera inside it and can be controlled from the smart phone app, driving your dog or cat crazy and giving them a little bit of fun exercise while you are away. 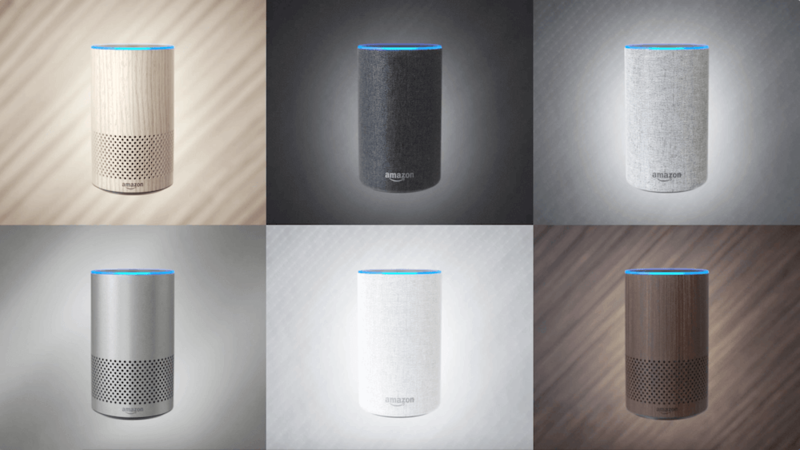 The new Echo Plus turns Alexa into a smart home hub, with Zigbee capabilities and automatic detection for smart home products. It also has improved audio and a lower price tag than the original. 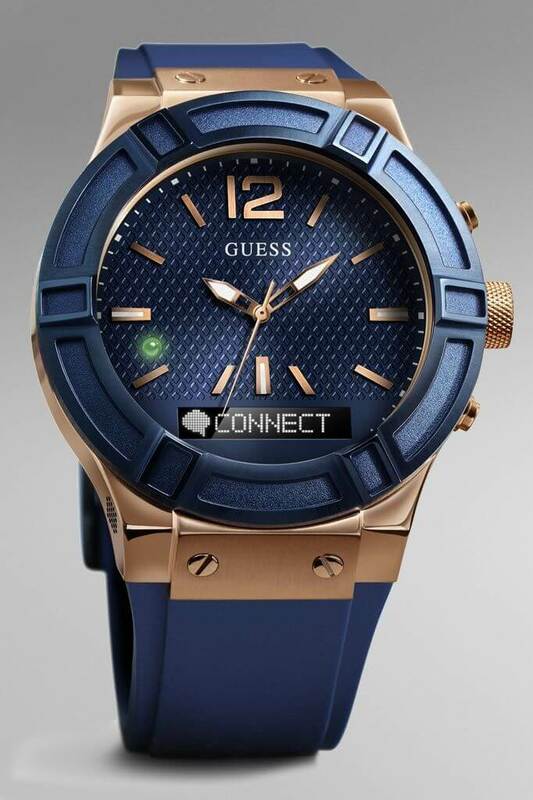 If you’re looking to take Alexa on the go, then the Guess Connect smart watch is one of your best options. 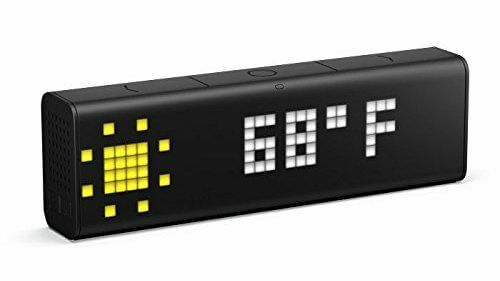 It comes in men’s and women’s styles, and has a classic look while still offering smart watch capabilities like traffic, weather, news, and more. This watch is one of the unique smart home gift ideas that anyone would love. Google Home is Amazon Echo’s biggest competitor. It was a huge hit during the 2016 holiday season, and has only grown in popularity since. It offers better search functionality and casting to television at a lower price point. Find out more in our full review of the product. 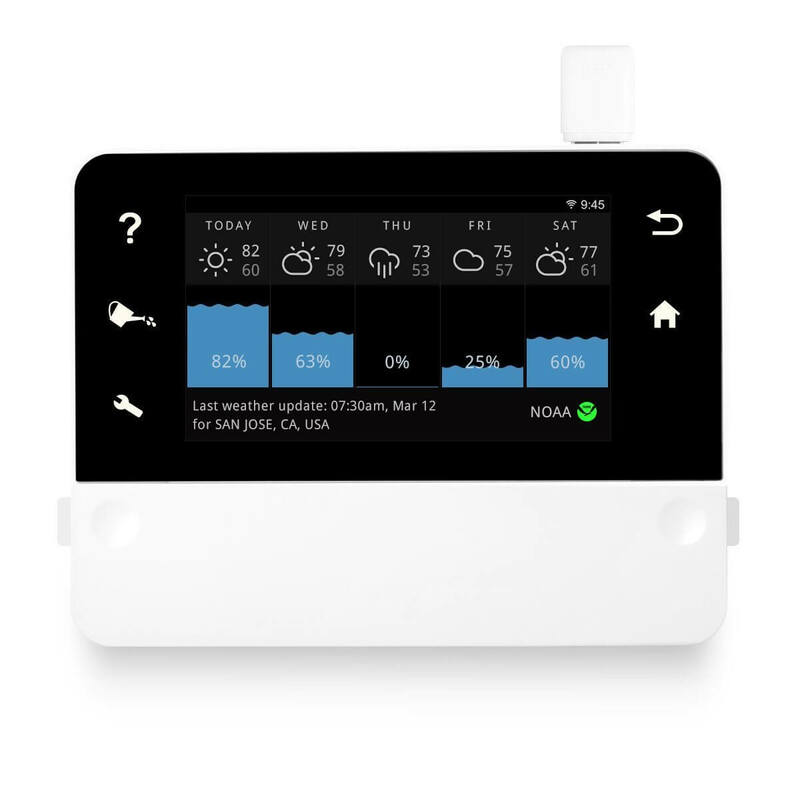 With a smart sprinkler controller like RainMachine, watering your lawn doesn’t have to be guesswork. This gift is perfect for the lawn-obsessed homeowner in your life. 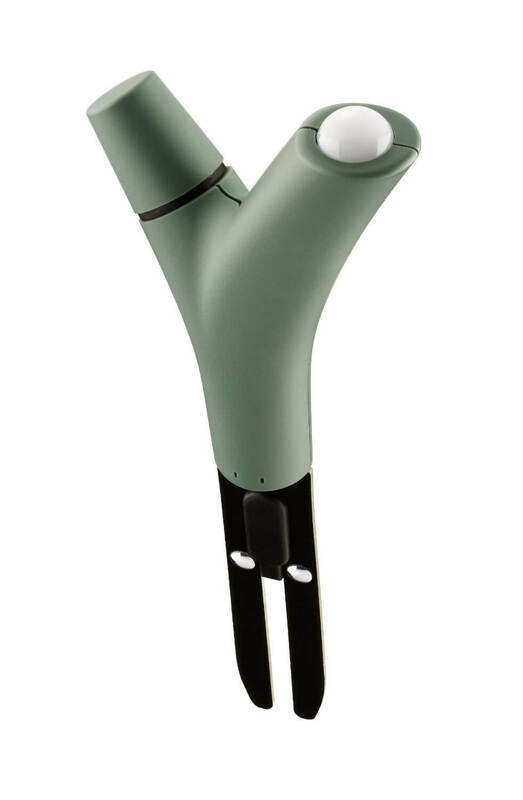 It incorporates hyperlocal weather to make sure your lawn isn’t watered while it’s raining. We compared RainMachine with Rachio and Skydrop and found that RainMachine came out on top, although the other two options are more affordable. It also saves you 80% on your water bill and integrates with Amazon Echo. 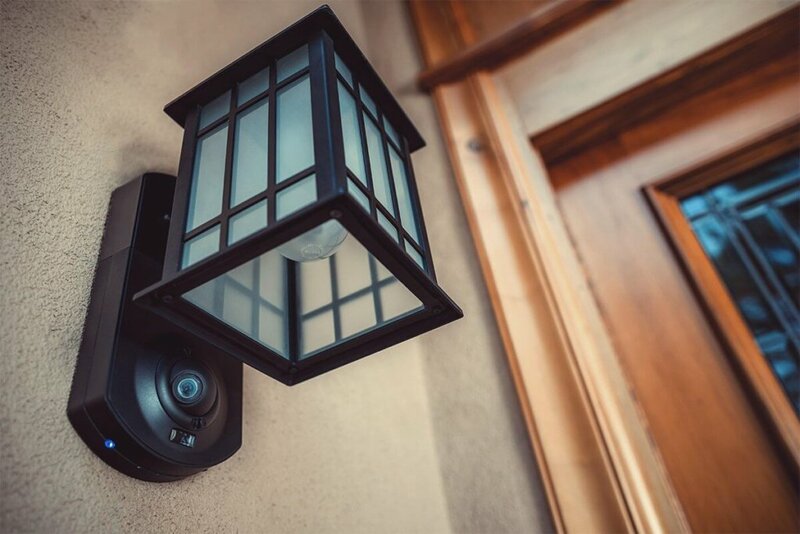 The Ring Floodlight Cam doubles as a 1080p HD security camera and a floodlight. It has a 110 decibel siren for alerting you when there is motion. The camera also has motion zones for more accurate monitoring and less false alarms. Smart thermostats lower your energy bill by incorporating weather patterns and making tiny adjustments. After just a few years, they pay for themselves. 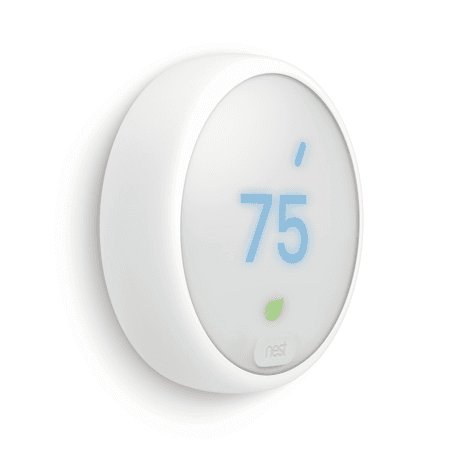 Find out if your local utilities company offers a smart thermostat rebate to make it an even more affordable, money-saving gift. A few alternatives are the Ecobee and Sensi smart thermostats. 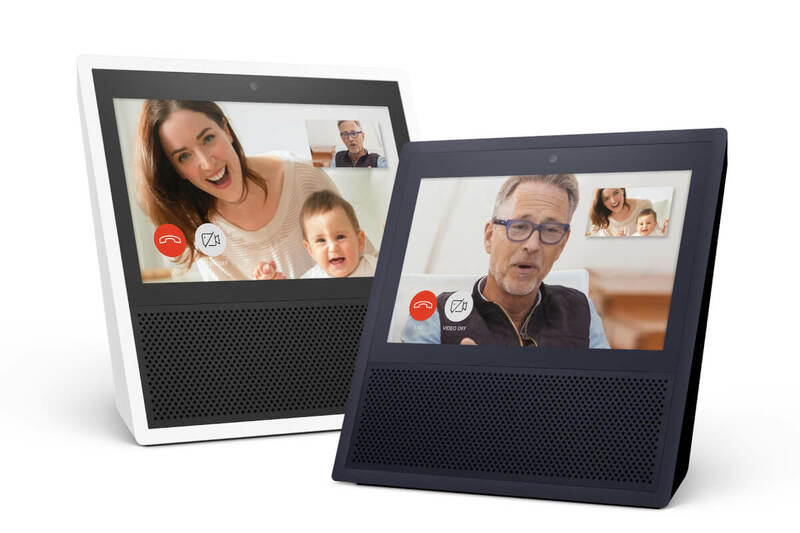 The perfect gift for any grandparent that lives far away, Echo Show allows for quick video calling with other Alexa devices. It also displays song lyrics, YouTube videos, Arlo security camera feeds, news, and more. It’s Amazon’s newest smart home showstopper, and it makes an excellent gift for almost anyone. 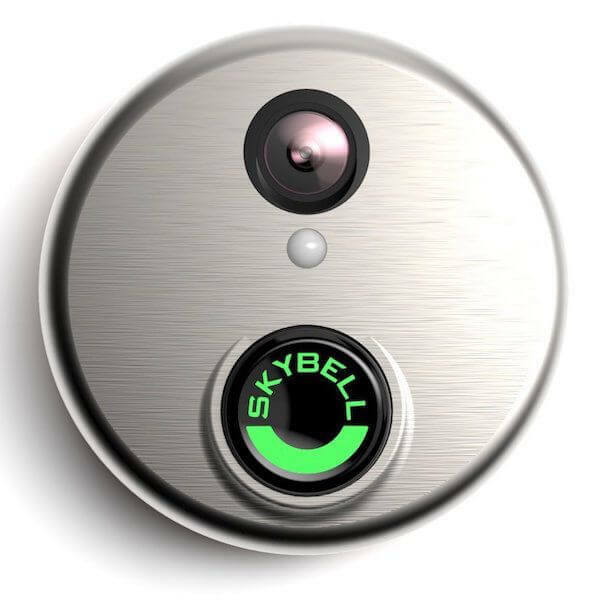 SkyBell lets you communicate with anyone who comes to your door, making it one of the best smart home gift ideas for the lazy one in your life. What sets this doorbell apart from the competition are features like quiet mode, a wide field of view, and compatibility with Kevo smart lock, Echo, and IFTTT. Before you laugh that we included this, this smart pet feeder has some incredible Amazon reviews. You can portion your dog’s food and feed them throughout the day, even while you’re away. 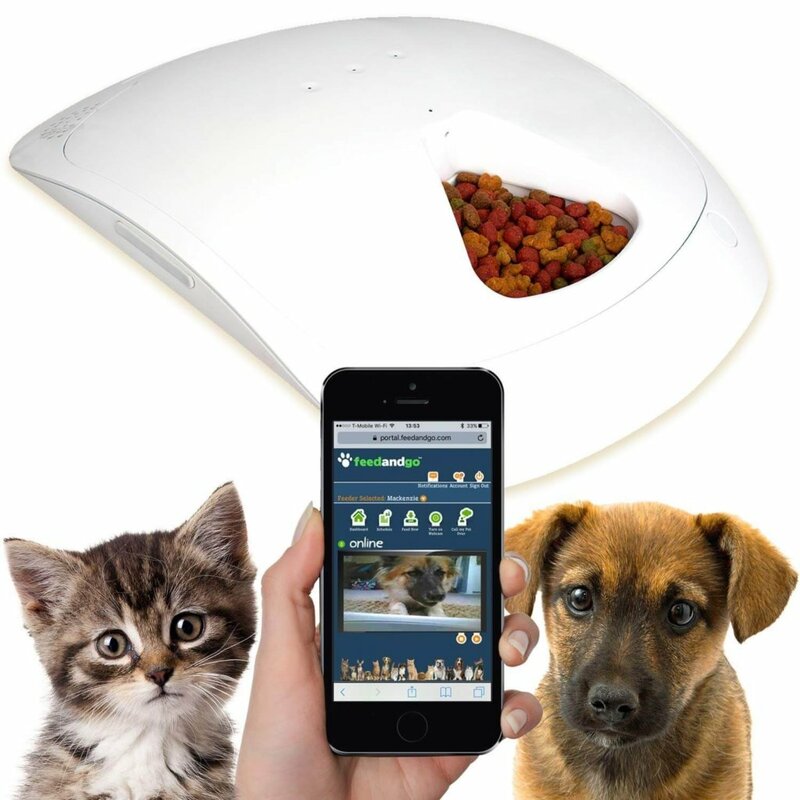 The included camera makes it easy to keep an eye on your dog or cat while they are eating. Buy this gift for the working dog-lover in your life; it’s great for easing separation anxiety for the pup, giving medications, and providing food for your pets while you are away. Similar to the Canary with its loud siren, Piper nv offers some of the best free cloud storage. It’s also compatible with Z-Wave door sensors, allowing you to replace an expensive security system forever. Buying for a future mom or dad? The Owlet smart sock monitors oxygen level and heart rate, alerting you if there is a sudden drop in either that needs your attention. It’s one of those products that gives peace of mind, allowing new parents to get some precious sleep while their newborn is resting safely. “Siri, lock my door.” This newest version of August allows you to say just that. 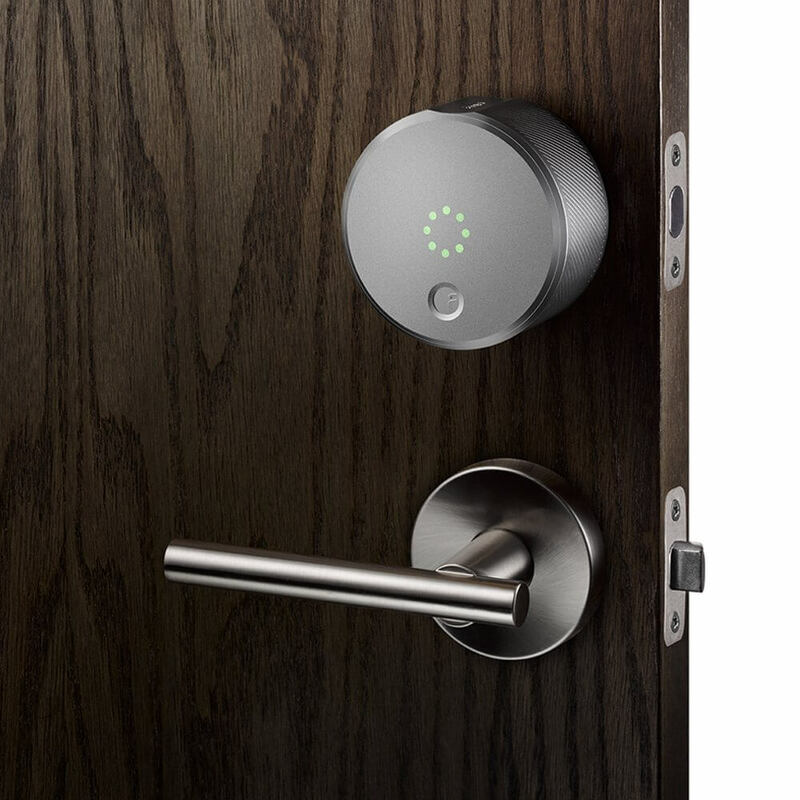 Its easy installation and option for adding a separate keyboard make it an excellent option and one of the best smart locks out there. Of all of our smart home gift ideas, this is one that almost anyone can use. Whether you get a full 8 hours per night or suffer from insomnia, the Withings smart sleep system is a speaker, a light, and a sleep cycle analyzer all in one. When it’s time to wake up, it gently awakens you with a gentle blue light, only during your lightest sleep cycle. The sleep sensor goes under your mattress to track how restless you are during the night. 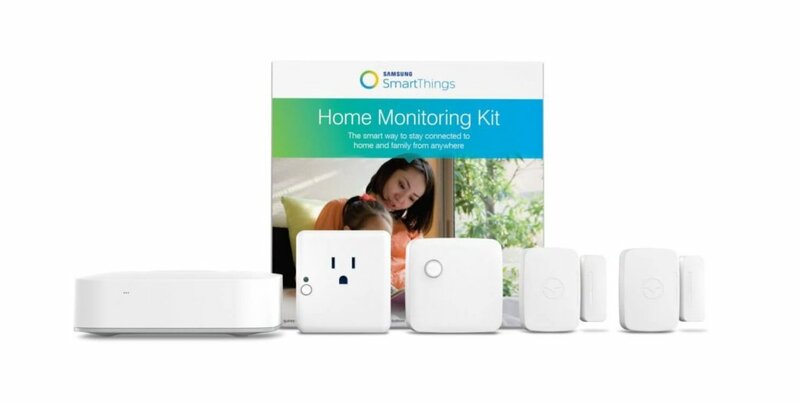 Samsung SmartThings is a complete system that lets you control outlets, motion sensors, and door/window sensors within one app. If you’re just getting started with SmartThings, read this review. The Arlo Pro 2 improves on the original Arlo Pro cameras, which is saying something since Arlo Pro was our favorite cameras for years. 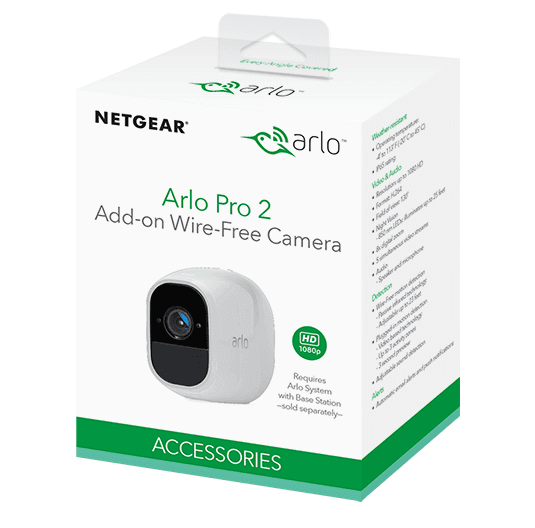 Arlo Pro 2 works indoor or outdoors, functions on battery or outlet power, and offers 7 days of free cloud storage. The upgrades over the original Arlo Pro include 1080p footage, and the option for continuous video recording. 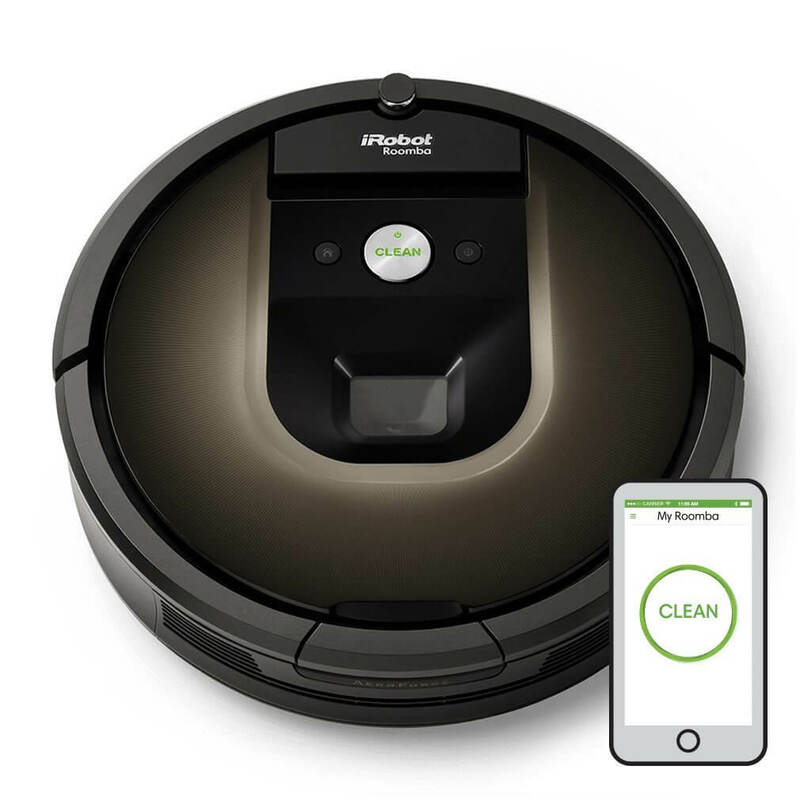 Set and schedule your Roomba from the iRobot HOME App, allowing you to come home from work to a clean house. You can also set preferences like Carpet Boost, cleaning once or twice, and final edge feature. Like other Roombas, this device self-docks to automatically charge. Roombas are the smart home gift ideas that make your life better all year. The Haiku smart fan is definitely smart. It turns on when you enter the room and turns off when you leave. 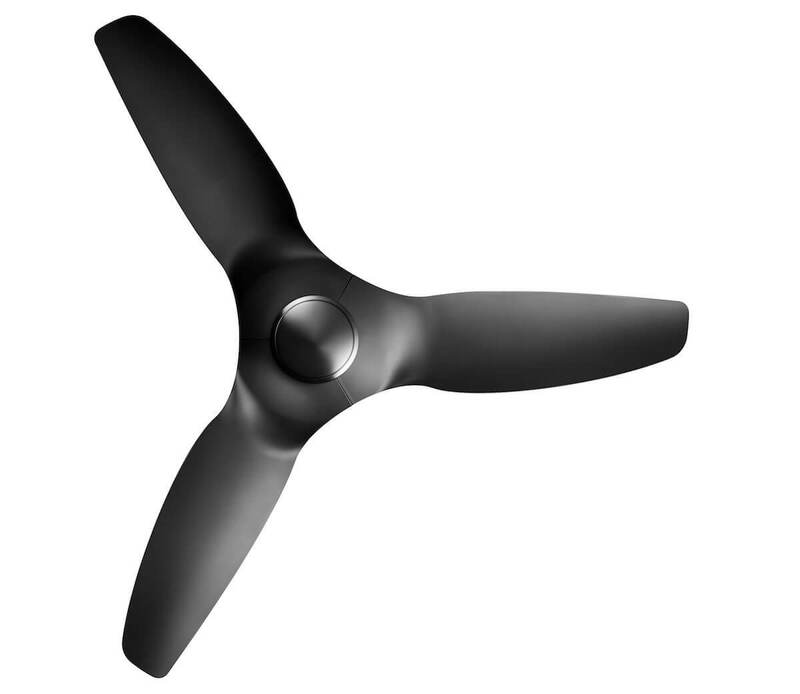 The fan tracks the temperature of the room, and turns on automatically when it gets too hot. Of course, it also works with Alexa and smart thermostats. We tried out Haiku in our hands-on video review and were very impressed. This gift is for the person who always complains about their home WiFi acting spotty. 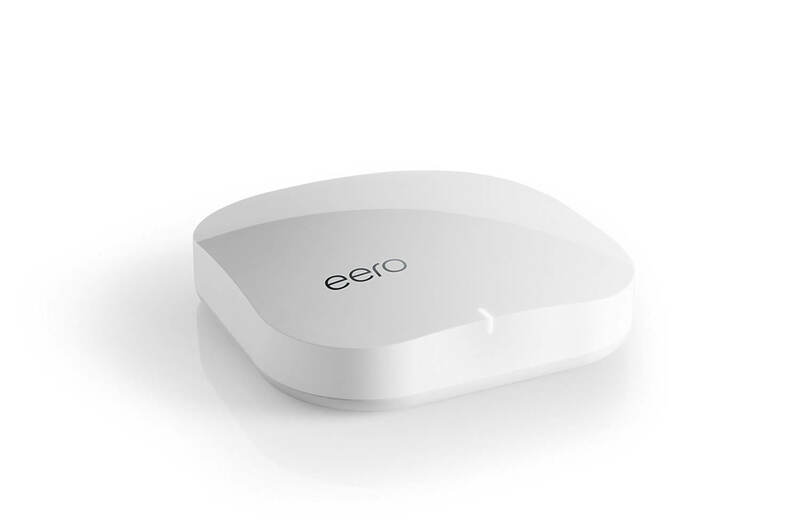 The eero range extender lets you blanket your home in faster WiFi so there are no dead zones. Google recently came out with a competitor Google WiFi, but it’s currently in preorder/waitlist phase. Google Home Max is the newest smart speaker from Google. Besides its amazing sound, it also has the Google Assistant, which can play music, answer questions, and control your smart home all in one place. 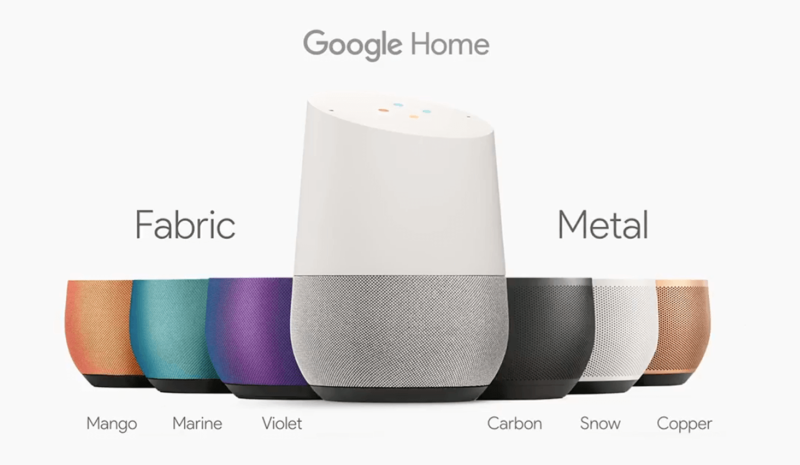 If your friend already has the Google Home or other Google products, then it’s a safe bet that Google Home Max would be a great gift for another area of their home. If you want to give the gift of home security without monthly fees, Nest Secure is a great option. 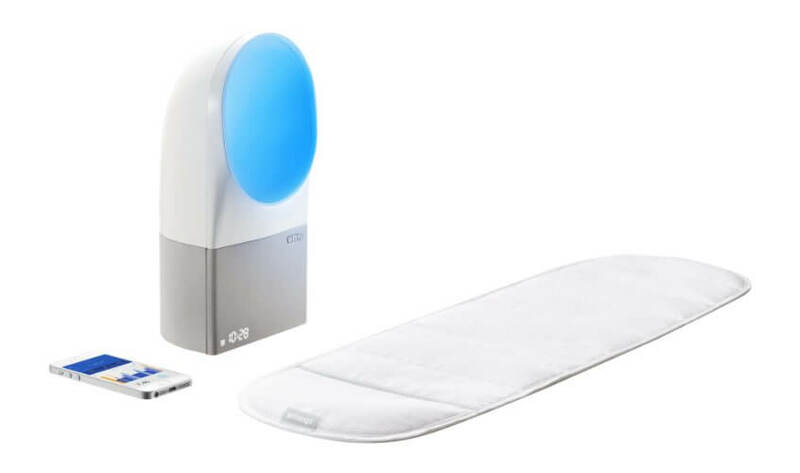 Its starter pack includes 2 Nest Tags for disarming, a Nest Guard base station with the keypad, and 2 Nest Detects, which serve as access and motion sensors. The system is very advanced and removes much of the annoyances in a traditional security system. Plus, monitoring fees are optional, saving you thousands of dollars each year. If you have $1,000 to drop on a smart home gift and your loved one hates mowing the lawn, meet the WORX robotic lawnmower. 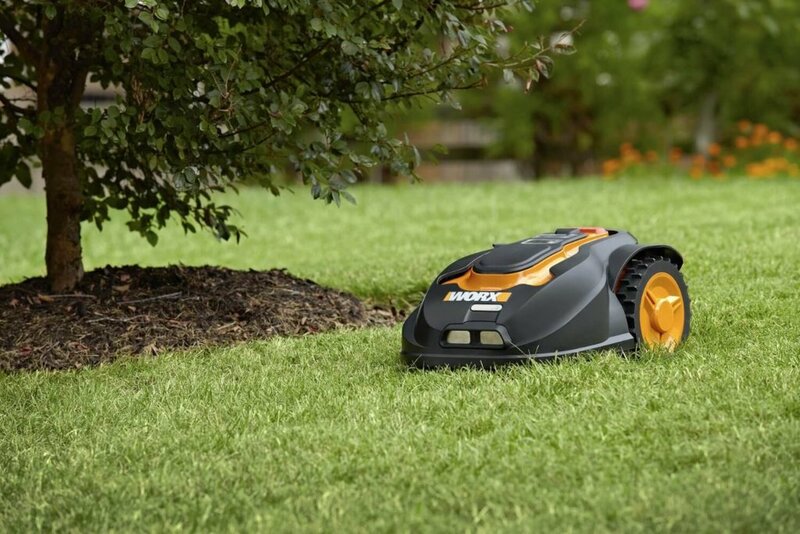 Similar to the Roomba, but for grass, WORX mows within an underground fence. It can go up hills with a 20-degree incline and is quiet enough to run at night without keeping up the neighbors. What are your favorite smart home gift ideas? What are you buying your friends and family? Let us know in the comments!